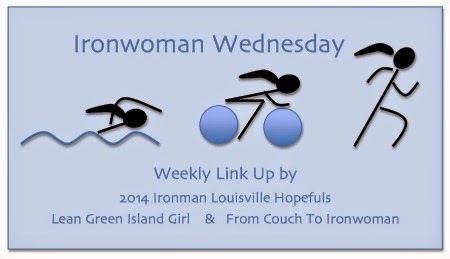 This week's topic is bike, the longest leg of a triathlon. Mike and I were swimmers growing up and picked up running relatively easily with the help of Couch-to-5K, but I hadn't ridden a bike in about 10 years when we started training for our first triathlon. It is, like they say, just like riding a bike. Our first bikes were very basic road bikes, but they did get us through our first five multi-sport events (two duathlons, two sprint tris and one Olympic tri). 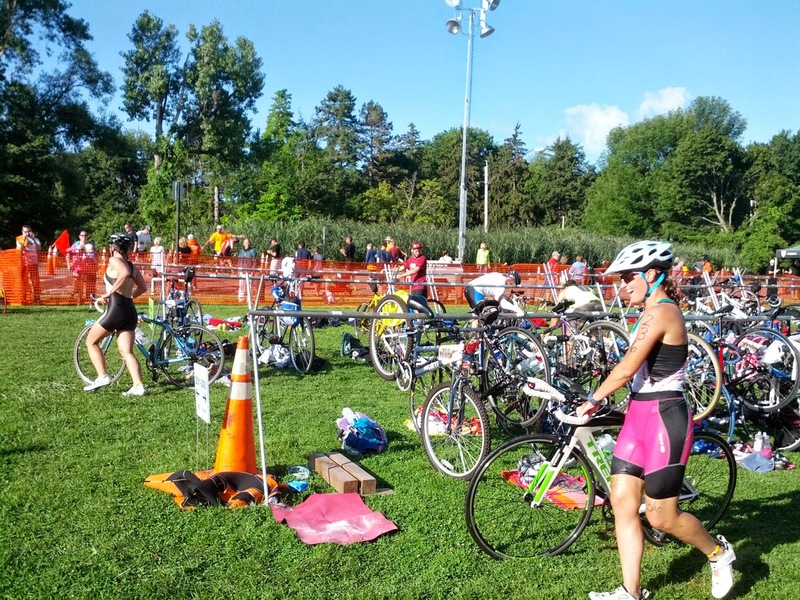 Really all you need to finish a triathlon (or duathlon) is a bike, helmet and running shoes. 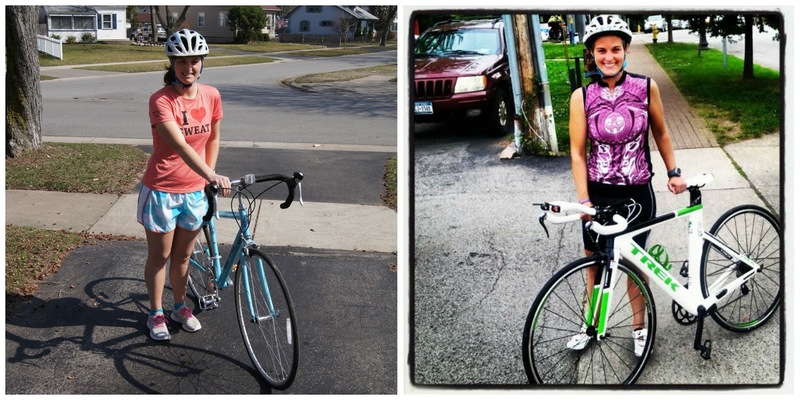 When it came time to train for our first 70.3, we knew that we were going to need to upgrade our bikes. We had already upgraded to clipless pedals, which took some getting used to and I fell A LOT the first time we practiced clipping in and out. We eventually decided that we were going to make the switch to tri bikes. They have helped immensely and I have really grown to love cycling because of my bike. My speed has increased from around 14mph on my old road bike to 16-17mph on a shorter ride on my tri bike. I am still not that fast and I am working on increasing my speed. One of my main goals for our Ironman is to be able to do the bike in 7 hours or less, which means that I will have to average around 16mph. The bike leg during a triathlon is different than cycling that you may see on TV. There is no peloton during a triathlon and in fact you can be penalized for drafting. During a USAT-sanctioned event all cyclists must keep three bike-lengths between them. If you start to overtake a cyclist and enter the "draft zone" you have 15 seconds to pass the other cyclist (and you may not back off if you initiated passing). The person who was passed must back off and exit the draft zone, and then if they need to they may attempt to pass again. Some other important rules to follow during a triathlon are that you must wear your helmet at all times while on your bike (before, during and after the race) and the chin strap must be buckled at all times. In order to prevent forgetting to do this, I just put my helmet on before I unrack my bike and take it off after I have re-racked my bike. In order to get better on the bike, you need to bike a lot, in different conditions, on the trainer, on hills, etc. In order to bike faster, you need to bike faster. Sometimes I struggle with allowing myself to push harder in the beginning of a ride because I am afraid that I won't be able to maintain that speed for the duration. Luckily, Mike is a faster cyclist than me and I spend the majority of our rides chasing him! Next week's topic is: run. oh man I'm still riding my hybrid and doing about ohhhh 13mph now...yeah I'm slow. I keep hearing that a road bike would make me faster, but I need to feel more comfortable on the bike to go for the skinnier tires :) ha! maybe if i didn't have to ride through the city that would help too! First off, I am incredibly happy to know that you rode about 14pmh on your old bike. That gives me some hope since that is about where I am as far as speed in concerned on my road sport bike. We ended up getting the Trek credit card, which when you first use it gives you 6 months of interest free credit.. if not, we probably wouldn't have been able to get them! I never knew the rule about passing and drafting so thanks for that! Not sure I'll ever upgrade from my trusty (old) road bike. Great post. I'm doing a combo training plan this summer as I have an 80k bike event in September and also am not going to stop training for the half marathon (and BQ) goals. I think a DU (and a bike upgrade) is in my future for sure. The drafting rule seems hard... but I guess you get used to it. Depending on how strict the race is (or really how big it is), sometimes you can be a little bit more lax. But at our 70.3 the officials were out in full force, and they will be for our Ironman too! I have been learning to love my tri bike this year... I'm also training for IM Louisville and also getting up to the 5 hour rides now. Hopefully we get to meet in Kentucky! We should try to do a blogger meet-up! That’s great news! Thanks for sharing. Awesome post. Most informative. Thx! , Super! Thanks especially for the video! Electric bikes square measure another kind of hybrid bikes which may convince be extraordinarily advantageous. they're ecologically friendly as a result of they run on battery http://www.coolcycling.net/best-hybrid-bikes.